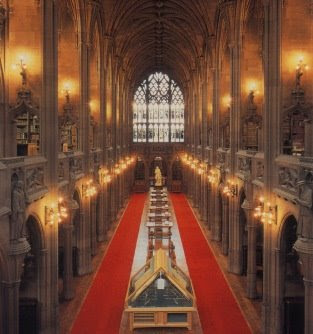 Last Saturday we called in at the John Rylands library in Manchester. I had walked past the library umpteen times, thinking it was a part of the University and not realising that this site of it ( on Deansgate, one of the main shopping streets) was open to the public. In fact, in the middle of the most modern part of Manchester, this is an ancient, stone cathedral like library. We didn't have time to do the whole audio tour or main exhibitions, and just took in the minature bookbinding exhibition housed in these cases , but we will be back. However, I did discover these in the shop. Not fabrics - paper. Sold as gift wrap paper but ideal for decorative journal pages and at £1.50 for a large sheet, affordable. It (and other paper products like it) are available from Shared Earth. "Get Paper Industry is a hand made paper products cooperative, using waste material such as cotton rags, waste paper and agriculture waste. The production process is environmentally friendly, with the paper being dried in sun light and a waste water treatment plan to process waste water. Their mission is to carry out traditional hand made paper crafts of Nepal in a commercial as well as environmentally sustainable manner and providing employment opportunity, mainly for women. 40% of Get Paper Industries profits is put back into social development issues of Nepal including girls education, AIDS awareness, tree plantation, and agriculture based income generating programmes."